It has been said before and bears repeating, but it is always gratifying when the stories of more obscure incidents and events of a historical period are published for the information and edification of all. Needless to say, World War II is replete with them, especially as the participants themselves are now fading from the scene. In this case, author Robert P. Watson explores a tragedy that occurred in the literal last week of the war and as a result was little known or publicized due to the chaos, confusion, and collapse of resistance and, of course, the joyous celebration that attended the Nazis’ capitulation in Europe—V-E Day. The format of the book is essentially four parts. It initially describes the main character of the story, if you will, the ocean liner Cap Arcona that at one time had been the pride of the German shipping company, Hamburg-Sud. Following its construction and launch, it made many cruises to South America for some ten years before being docked in Germany once the war had begun, and employed as a training ship for the German navy, the Kriegsmarine. As the war progressed and the ship sat rusting and without proper maintenance, Nazi Propaganda Minister Joseph Goebbels determined to use the ship to portray the sinking of the Titanic as the plot for a feature length cinematic propaganda effort that would denigrate and otherwise place the British in a bad light. The film was ultimately over budget, behind schedule, and never shown in Germany itself. The director was the recipient of the wrath of the Nazi regime as a result and most likely killed for an anti-Nazi outburst on set. Finally, the fourth part recounts the final tragedy: The evacuation of the inmates of many of the concentration camps to prevent their falling into Allied hands and to be potentially used as end-of-the-war bargaining chips in negotiations. Many of the prisoners were marched on foot or transported by truck and train to ports on the Baltic Sea where they were herded aboard various ships anchored there, including the Cap Arcona. On May 3, 1945, the ships were attacked by aircraft of the Royal Air Force. The result was the destruction of many of those ships and the deaths of untold and innumerable thousands by aircraft ordnance, burning, drowning, and onshore shooting of many survivors by German guards and soldiers. The final count of casualties is unknown, again partly as a result of the ongoing confusion and chaos attendant at the end of the war and, interestingly, a lack of the usual German penchant for documentation. In the event, once the ports had been overrun by the British, they did do all that was humanly possible to succor the survivors. There are two appendices included. 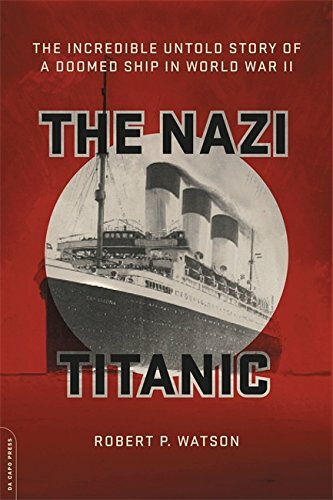 The first covers the reason why the Nazis loaded the prisoners on the ships. Of course, speculation ranged from deliberately scuttling the ships at sea to destroy their “cargo” to shipping them to Norway as part of a Nazi last-stand in that country as the previously mentioned bargaining chips. The second delves into whether or not the RAF knew of the prisoners onboard. Evidently, the answer was yes, but the intelligence was not passed on to the pilots flying the mission, many of whom did not learn of the tragedy until decades after the fact. In any case, news of the event was hushed up by the British and then “lost” in the tumultuous end of the war. The dead were buried in mass graves, and the survivors, some still living today, scattered to the four corners of the world. Presently, there is a small onshore monument to the dead. Although the bibliography is somewhat overloaded with secondary sources, the author has employed primary sources such as archives, oral histories, and interviews to tell the story of this ship and its tragic demise. Unfortunately, there is no map to place the location of the action so readers must consult their own. Otherwise, this is an easily read, well-written, and interesting story of a largely unknown event of World War II, notwithstanding the graphic depictions and circumstances of the Holocaust victims involved. That many survived the violent destruction of the Cap Arcona and the other ships is a testament to the human spirit and will to survive. This story needed to be told lest we forget.